You guys know I love easy recipes and that I love chocolate. So when I can combine the two? 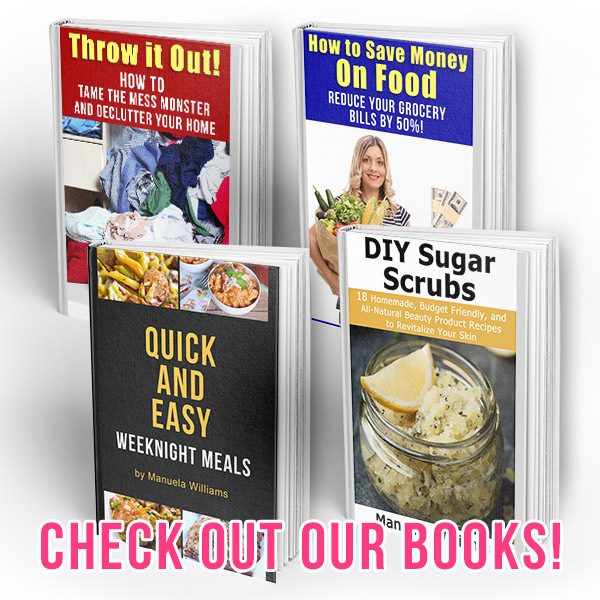 Instant new favorite recipe! I recently got a cute new silicone baking pan with bunny face molds, and was trying to decide what to make first. 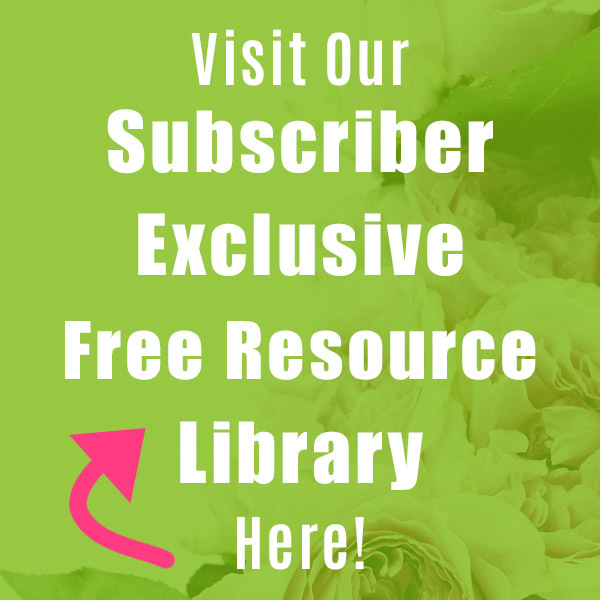 I figured I couldn’t go wrong with a no-bake chocolate recipe! I added the sprinkles for some extra color and crunch! 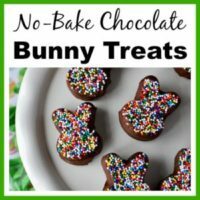 To try these for yourself, take a look at my recipe for these Easy No-Bake Chocolate Bunny Treats! 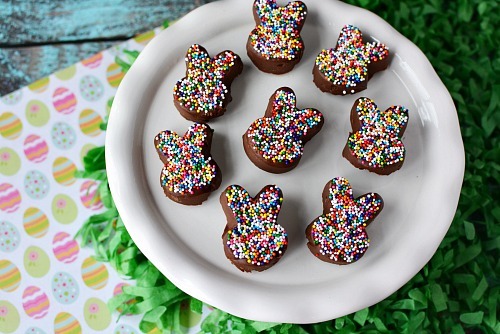 I think these chocolate bunny treats taste kind of like fudge! They’re just so chocolaty and delicious! We ate all of the ones I made right away, but I imagine that they’d also make great party favor treats! And just because they’re bunnies doesn’t mean you can only eat these for Easter. 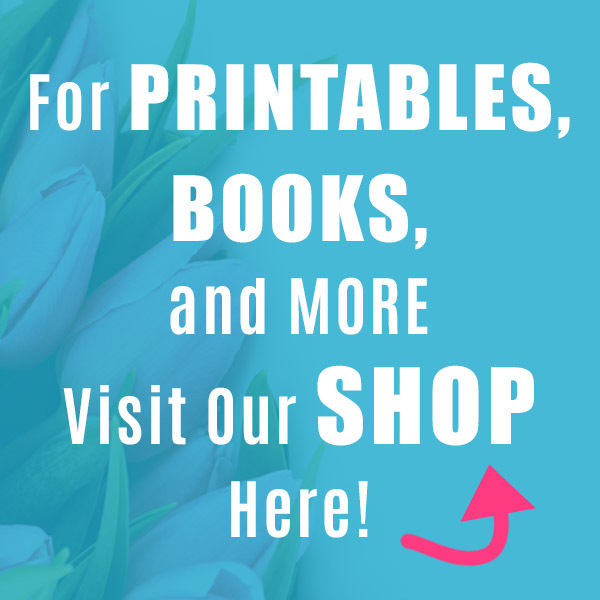 These are perfect desserts for any time in spring! 1. Place the bunny silicone pan on a baking sheet. Clear a spot in your refrigerator for the baking sheet and place it down to make sure it’s nice and level. Remove the sheet and silicone pan from the refrigerator. 2. Fill each bunny cavity with colorful sprinkles. 3. In a saucepan on medium heat, melt chocolate chips and sweetened condensed milk. Stir constantly until melted. Remove from heat and stir in vanilla. 4. Spoon chocolate into each bunny cavity, using the tip of your spoon to make sure it gets up into the ears. Repeat until all cavities are filled. 5. Place sheet in the refrigerator for about 30 minutes. If you forget about the pan and chill it for too long, the bunnies can be hard to remove. In that case, you’ll want to set the silicone pan in a shallow dish of hot water to loosen the bunnies up. 6. Pop the chocolate bunnies out of the pan by carefully inverting the bunny cavities. 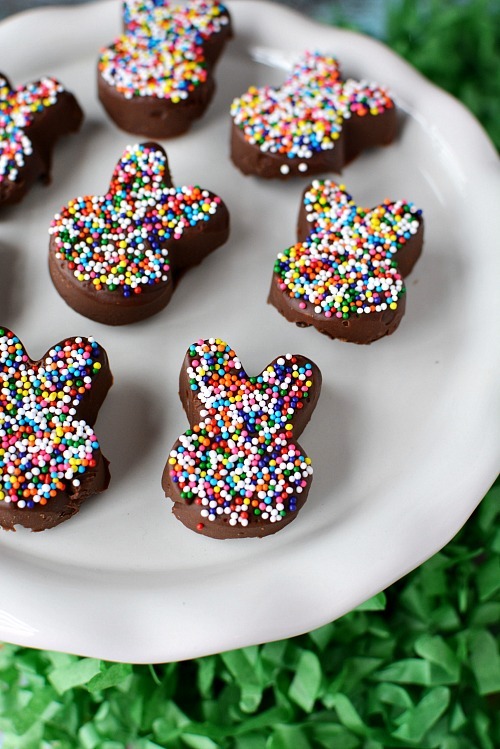 Then enjoy your no-bake chocolate bunny treats! 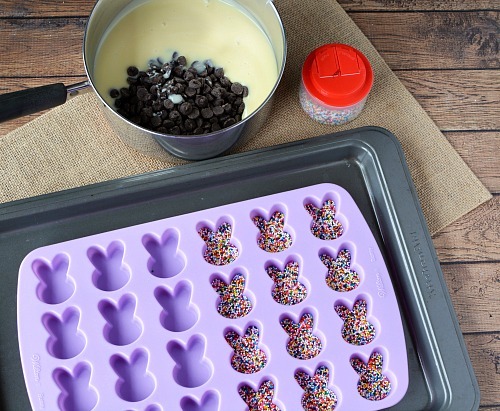 Place the bunny silicone pan on a baking sheet. Clear a spot in your refrigerator for the baking sheet and place it down to make sure it’s nice and level. Remove the sheet and silicone pan from the refrigerator. Fill each bunny cavity with colorful sprinkles. In a saucepan on medium heat, melt chocolate chips and sweetened condensed milk. Stir constantly until melted. Remove from heat and stir in vanilla. Spoon chocolate into each bunny cavity, using the tip of your spoon to make sure it gets up into the ears. Repeat until all cavities are filled. Place sheet in the refrigerator for about 30 minutes. If you forget about the pan and chill it for too long, the bunnies can be hard to remove. In that case, you’ll want to set the silicone pan in a shallow dish of hot water to loosen the bunnies up. 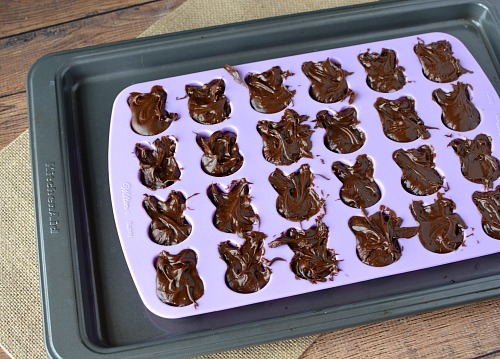 Pop the chocolate bunnies out of the pan by carefully inverting the bunny cavities. Do you often make desserts in cute shapes? These are so adorable! And who doesn’t love chocolate? 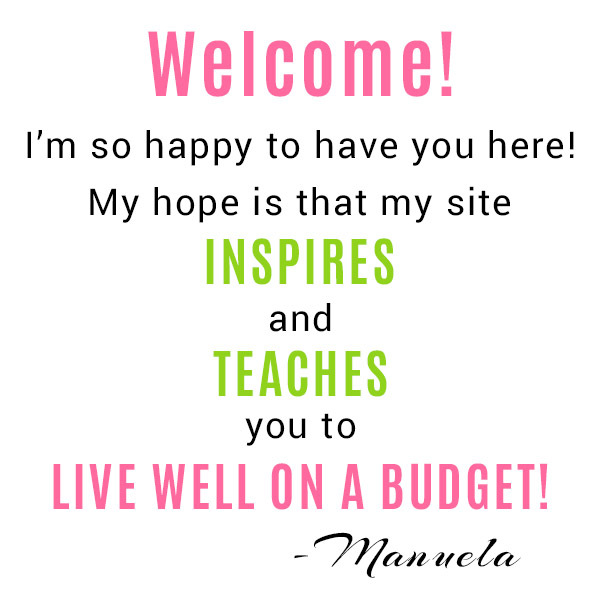 🙂 Thanks for sharing at Merry Monday this week! Pinning!